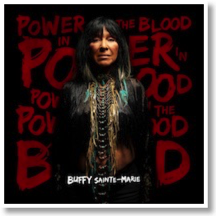 Power in the Blood, the 16th studio album from internationally renowned Cree recording artist Buffy Sainte-Marie, is a tour-de-force of the singer’s gutsiest social critiques and most vulnerable poetry. Sprinkled with contemporary electric sounds, powwow samples, rockabilly blues riffs and the playful, soul-filled acoustic melodies that put her on the musical map half a century ago, there is something to please many. The twelve-track album contains 10 original tracks, including a revamp of “It’s My Way,” the acclaimed title track from her 1964 debut record. Sainte-Marie’s soulful vocals lend an air of the road well-traveled with this poignant rerecording, while honoring the young, hopeful spirit of the original (“Now I can tell you things I’ve done/and I can sing you songs I’ve sung/But there’s one thing I can’t give/for I and I alone can live/the years I’ve known and the life I’ve grown/I got a way I’m going and it’s my way”). “Power in the Blood” is an electronic remake of the Alabama 3 song with modified anti-war, anti-GMO, anti-corporate interest lyrics. This moving piece harkens back to the late 20th century activism that gave rise to Sainte-Marie’s generation of artists while addressing contemporary social and political issues relevant to younger listeners (“There’s military interest, there are GMOs in paradise…/Young soldiers driving tanks/but old thieves they drive the banks…/When that call it comes I will say no no no to war”). The album concludes with the uplifting “Carry It On,” a crescendo of acoustic, electric, rock and folk melodies with eloquent lyrics moving the listener to nurture their link to the natural world and global community. A joyful, transcendent final cut, it brings the rest of the album together and leaves us hungering for Sainte-Marie’s next creation. 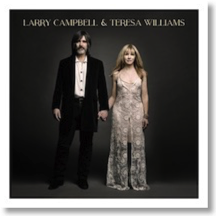 The husband and wife duo Larry Campbell and Teresa Williams have recently released their self-titled debut album. The different styles of Campbell and Williams come together beautifully, with Williams’ soft voice accompanied by Campbell’s upbeat instrumentals giving the album an artful flair. The track “Midnight Highway” is an example of this cohesion. Both Campbell’s and Williams’ voices are romantic and strong in this song. The ballad shows the dynamic nature that is found throughout the album. In “Another One More Time,” the instrumentals are subtler than they are in the other songs. This shift works well because it gives Williams a chance to showcase her classic vocals. Campbell backs his wife up with vocals that are intense but not exaggerated. Williams takes center stage in most of the songs, but in “Everybody Loves You,” Campbell steps on stage with his uplifting voice, while Williams sings backup. The singing is moving. The duo’s debut album is filled with gorgeous duets, and their love can be felt in the music throughout the record. 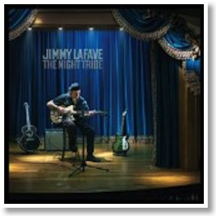 On Jimmy LaFave’s The Night Tribe, there’s an unmistakable freedom that flows throughout the album; the freedom of the open road, the freedom of choices, of concerns, of decisions, some made and done and some yet to come, and the freedom of being. The album’s opening track, “The Beauty of You,” LaFave jumps wholeheartedly into the encompassing freedom of nature and of life with open arms. He sings not just of the simplicity of being, but of the reassurance of being as well, of the easy beauty that comes with being in a “world filled with wonder”: “tall pine trees roll around me, snowcapped mountains up above me, and my heart is filled with gladness of all the things I love.” Between a cascading piano solo and flourishing affected guitars that blossom into a wavy, reverberated crescendo, LaFave’s voice holds steady throughout the song and keeps the mosaic of music anchored neatly in its sincere and simple form, as if to reinforce the joys of a simple freedom. However, the pangs of doubt and uncertainty that are endemic of any freedom, and are hinted at in the chorus of “The Beauty of You,” begin to open themselves up to larger feelings of aimlessness, uncertainty, and trepidation throughout the album. On “Journey Through the Past,” it’s the freedom of time that begins to gnaw at the sure-footed confidence of LaFave’s opener, forcing him to reconsider his place in a lover’s heart as time, more than any one particular act or deed, begins to lengthen the gaps between them: “Will your restless heart come back to mine? Will it journey through the past? Will I still be in your eyes and on your mind?” LaFave pleads, amidst a musical canvas that is awash with open space and spare places, all evoking the loss and desire of a love tempered by time. On no song is the burden of freedom made clearer than on the titular track “The Night Tribe,” a song that evokes all of the empty, listless feelings of a night gone on too long. LaFave sings “You’re standing at the crossroads with your amp turned to ten, but you’re playing the same old blues again and again,” which, for all of his verbosity and emotional appeals in “Trying to Get Back to You,” sounds a lot like what he’s doing: repeating the same mechanisms in a futile search for something new. But instead of wallowing in his captivity, LaFave seems to revel in it. Whatever guise the night takes on for him, be it the “neon glow of perpetual sin” or the simple open road where one can confront himself openly and honestly in the waning hours of the night, LaFave wants to invite others to participate in it with him; or, rather, to celebrate it with him, the freedom that comes with time and reflection. The spectrum of reflection that LaFave embarks in The Night Tribe is testament enough to the joy that can be found traversing even the more burdensome expanses of simple freedom. 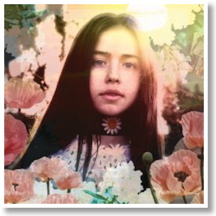 Flo Morrissey’s debut album, Tomorrow Will Be Beautiful, was written throughout her teen years, and her singing voice is able to reach out to a diverse and older audience. Morrissey is just starting her career, but her artful style shows a powerful musical energy on the release. Her song, “Wildflower,” features a melody that is calm and soothing. “Pages of Gold” is another track that is sweetly performed. It is diverse, especially in the chorus, which highlights her voice and fresh instrumentals. The track’s music is clean and crisp. The title song, “Tomorrow Will Be Beautiful,” is the final tune on Morrissey’s album. The tone of the music is peaceful, and reminiscent of classical music, and tells the listener that tomorrow will bring more than today does. Morrissey’s album, Tomorrow Will Be Beautiful, is serene, and features melodic elements that make it dream-like, and seems to show an artist with more to offer in the future.